The modest Shingle-style building features a rusticated fieldstone foundation and an arch that is blended and finished with brick, a design Gilbert was using in the Barnum Cottage at the same time and would use later in the stairway of the Virginia Street Church (1886). Surrounding porches on all four facades are fitted with shingled railings. The canted dormer and the ventilator/chimney design are modest elements exploited to the greatest possible effect. Charles Noyes was in partnership with his brother, D.R. Noyes, and his brother's next-door neighbor on Summit Avenue, E.H. Cutler. The firm was Noyes Brothers & Cutler, wholesale druggists located in what is now Park Square Court across from Mears Park on Sixth Street. Noyes was a Yankee blueblood from Connecticut who came to St. Paul in 1868, the year the Gilberts arrived. He was a director of several banks and businesses and a member of the Minnesota Boat Club, Town & Country Club, Minnesota Club, and Informal Club. He was also prominent in the Presbyterian Church. 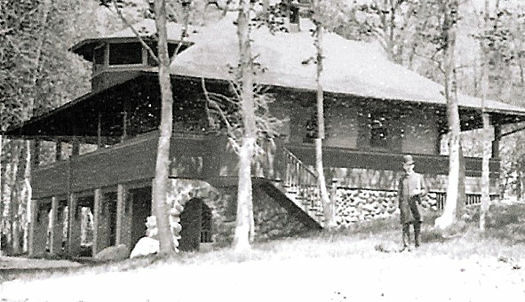 Noyes had previously built a Stick-style cottage (an extant historic landmark known as the "Red Chalet") on the western shore of White Bear Lake. 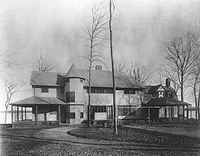 The Noyes Cottage served as a prototype for other summer cottages Gilbert would design. This small project was so important for Gilbert that he presented his client with four watercolor renderings. He sent a picture of it to his fiancee years later, and he would publish the design in Architecture Reviewer in 1897. This project also became the starting point for two lucrative alliances for Gilbert—with Noyes and with White Bear Lake. 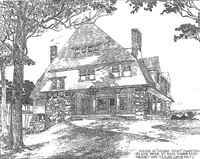 The Noyes Cottage was razed in 1951.